Tendrán lugar el 9 de septiembre de 2017 en el Talking Stick Resort & Casino, 9800 Talking Stick Way , Scottsdale, AZ 85256 USA. 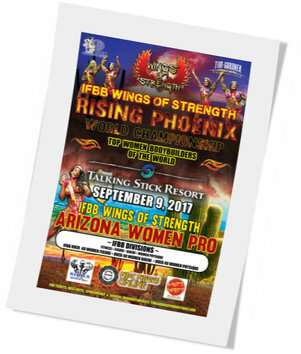 Preselección IFBB Wings of Strength Rising Phoenix World Championship: 9:30 a.m.
Preselección IFBB Wings of Strength Arizona Women Pro: 11:30 a.m. This entry was posted on jueves, septiembre 7th, 2017 at 2:44 pm	and is filed under Campeonatos. You can follow any responses to this entry through the RSS 2.0 feed.Both comments and pings are currently closed.